World of Warcraft has been around for a long time, and players have happily been running errands for NPCs throughout every expansion. Even as the story behind the game continues to evolve, the role of the player evolves as well. In past years, it’s been down a fixed, set path – first you were an adventurer, then you were a hero, then you were a champion, a leader of your faction’s campaign, the shining representative of everything your chosen class has come to represent. It’s apparent your character’s journey has built them quite the reputation – but is that what players want? Enter Battle for Azeroth, and the quiet implementation of player choice. Nothing major; just a few small moments where your character can state for the record where their loyalties lie and what they’re willing (or unwilling) to do for their faction. It’s not an overhaul of the questing system – it’s just an interesting way to offer a few alternative paths for players who might not necessarily agree with where the story is leading. But it’s still a choice in regards to the narrative we feel is best suited to our characters. That’s a far cry from the days of Cataclysm, where we were ushered along on a predetermined story. It’s not Uldum, where our characters were abruptly taken out of any action time and again so the game could show us what they were doing – not letting us choose what we would like to do with them. 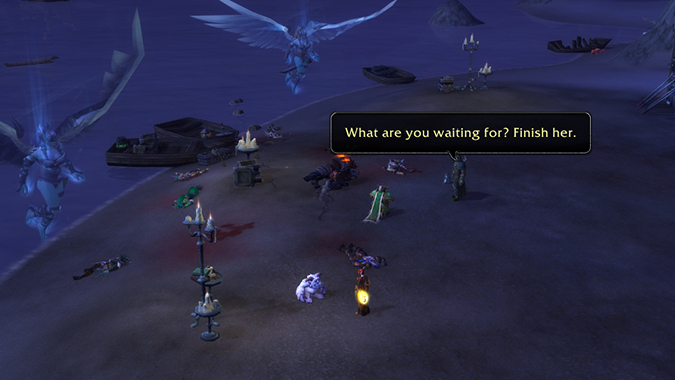 Maybe it’s not a full narrative overhaul to the way quests and stories work in WoW, but it’s a start. My Horde characters can pick whether or not they support the current Warchief, and the decision they make will apparently come into play as the story progresses. While I’m not expecting any major narrative twists locked in by whatever I happen to choose, it’s still nice that it’ll get some kind of nod of recognition later down the road. And who knows? Maybe someday that system will be extended a little further. Obviously, narrative changes are something I’m keenly interested in, but I’m interested in hearing what you guys think as well. Do you like the idea of being able to offer your own in-character input to what’s going on in game? Is it satisfying to make those choices, even if we’re not sure where they’re going to lead just yet? Is this something you’d like to see more of in future expansions? How important are narrative choices in regards to how you play the game?